Could you please explain how can I do that resampling in MATLAB? I mean after receiving the signal, which is y = conv(x,h) + n; where x is the transmitted signal and h is the channel, and n is white noise. so. how can I perform the resampling for y ? R_D_fil_be=Y_r_new(1,(isij-1)*L_perOFDM+1:isij*L_perOFDM);  %%L_perOFDM is number of carrier multiplied my symbol. 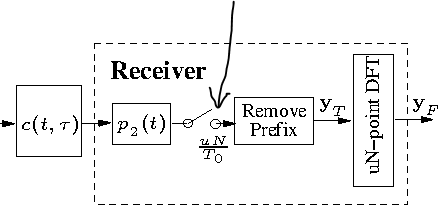 Browse other questions tagged matlab discrete-signals ofdm or ask your own question. How Can I Resample a Signal with an Arbitrary Factor (For Example - 128000Hz to 16000.1Hz) in MATLAB? How to simulate two OFDM Users with low complexity FFT/IFFT?